Artwork courtesy Texas Parks and Wildlife Department © 2004. Note: For information the full range of aquatic species that inhabit Texas waters, visit www.tpwd.state.tx.us/landwater/water/aquaticspecies. 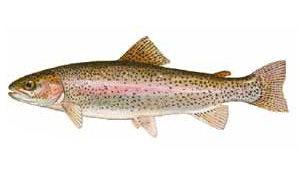 Trout—The Texas Parks and Wildlife Department (TPWD) and Trout Unlimited seasonally stock most of the Texas trout during December and January while the temperatures are colder. 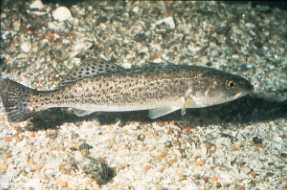 For stocking information in your area, visit the TPWD Web site.These fish are typically in the 9” to 12” range. The Guadalupe River Trout Unlimited (GRTU) stocks fish in the Guadalupe River tailrace waters in the Hill County. The GRTU fish are usually larger with some two to four pound trophies included. These are all hatchery-raised fish that require a little patience when fishing as they are not naturalized and prefer some experimentation with your offerings. Your best bet is to think small and use size 16 to 24 nymphs like midge larvae, brassies, zebra midges, prince nymphs, beadhead hare’s ears or an attractor nymphs, and egg patterns. Small wooly buggers are also effective. There are caddis and mayfly hatches; so when seeing takes on the surface, try a small Adams, blue wing olive (BWO), or elk hair caddis. Sunfish—This is probably one of the most abundant and scrappiest fighting fish in our waters, and it’s available spring to fall. A lot of us developed our love of fishing as kids with the little “sunnie” tugging at the other end of our line. Catching the sunfish was a delight then as it is now! These little fish have the “no fear” attitude and will go after most any fly presented to them. Undoubtedly, the surface popper is the most enjoyable to fish. Expect a lightening fast hit, and you’ll need lightening fast reactions to set the hook. Midsummer, these little speed demons will devour small poppers, hoppers, and all sorts of terrestrials, and foam bugs. You can also fish subsurface with the micro jig (pink is best), attractor nymphs, and small wooly buggers. These fish rank among the top in popularity and availability. Rio Grande Cichlids—Waters of the Hill Country are home to this frisky little fish. TheRio rivals the sunfish in beauty with its dark black/olive background and electric blue spots. The male has a pronounced hump on his head that is undeniable when caught. The monogamous pairs are often seen skittishly protecting their nests in gravel bottoms. 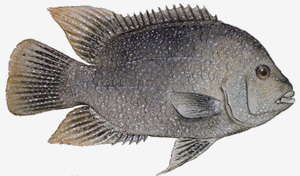 This cichlid thrives in warm water and is easiest to fool when the water temps reach the 80s. They are much less aggressive as waters cool below 70 and completely inactive after the water drops below 49 degrees or so. Spring-fed waters such as the Llano River, Guadalupe, and the central Texas Edwards Plateau rivers find population of the Rio. They seem to be attracted to a variety of colors but black and olive work especially well. The key to fly selection is to think small because of their relatively tiny mouth. Size 10 and smaller hoppers, crickets, beetles, and ants are effective surface patterns especially when cast over rocky shallows that often hold large number of Rios. Small streamers and nymphs with and without beadheads work well subsurface. Try bouncing micro jigs on the bottom around nests, and you’ll often see them attack in a territorial manner. What works well on one outing might be left home on the next outing to the same waters as they are not easily fooled twice with the same fly. Largemouth Bass—This predacious fish lives in warm water lakes and rivers. Lake largemouth bass or “bucketmouths” are the ones that dreams and record catches are made of, including high-profile tournament fishing. 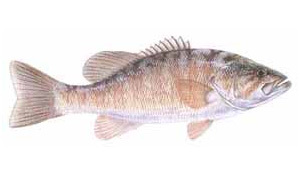 The river bass are the smaller, leaner cousins that can be found while wading most of our rivers. These are available in our waters from spring to fall, and you’ll usually encounter them along with the sunfish, which is a primary ingredient in their diets. Bass will take larger poppers that “push” a lot of water, making vibrations, which they sense in their lateral lines (the long dark bands running lengthwise down the fish—aka “meal sensors”). This makes for explosive takes on the surface. They also are attracted by baitfish patterns like the Clouser minnow, zonkers, or leech patterns. Crayfish imitations are good patterns, too. Larger flies usually attract larger fish. You would use a scaled-down size of these flies for the smaller river bass. Smallmouth Bass—The smallmouth bass is known for being one of the hardest fighting freshwater fish in its weight class. The “smallie” tears out with powerful runs, high leaps, and tail walking on the water. They prefer cooler, cleaner water with gravel bottoms as opposed to mud. They will move to deeper waters as the summer heats up. Like the largemouths, they consume crayfish, minnows, and insects. Productive flies include the Clouser minnow, zonkers, crayfish, beadhead wooly buggers, sculpins, and poppers. Guadalupe Bass—This wily little bass holds a special place in the hearts of Texans, as it is our state fish. The Guad lives only in the steams of the Edwards Plateau in central Texas. It is a rather small-size bass with record fish around three pounds. 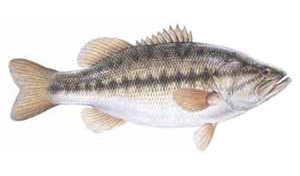 It is a cousin of the largemouth bass and has a black, diamond-shaped pattern running down its sides. Its mouth is not as huge as the largemouth’s. Fish deep pools and still water for the Guad. It can also be found in flowing streams. The diet is the same as its cousin: minnows, crayfish, and bugs; so fish the Clouser minnow, small zonkers, crayfish, wooly buggers, and some beadhead nymphs. 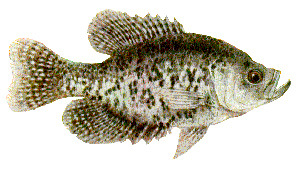 Crappie—Crappie (OK, it is pronounced “Crop E”) are cousins to sunfish and are more available to those boat fishing. 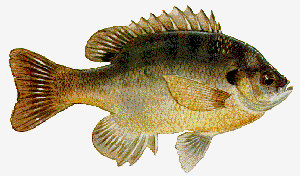 They are known by a multitude of names such as speckled bass, white perch, papermouths, and many more. Crappie “holes,” (submerged brush, trees, and stumps), are jig fished with small jighead flies from a boat. Crappie tend to stay in the treetops. You can cast to submerged bridges or timber and use short strips with a small white wooly bugger or white zonker. If you catch one, stay in that same area as these fish tend to travel in groups. 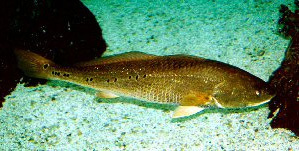 Redfish—Now we’re onto saltwater fish. Redfish on a fly rod is one of those “can’t be beat” experiences. If you can land the fly by the Reds mouth you usually have a hook up. Clouser’s, Mylar minnows, and shrimp and crab patterns worked on the bottom are excellent for Reds. Speckled trout (“Specs”), are a lot of fun to catch from the piers at night. The lights draw the Specs to feed. Fishing a top water popper along the line where the light casts a shadow against the darkness of the water will make for some top water “action” takes. Saltwater fishing is specialized and requires some accuracy casting, special equipment and gear, knowledge of the saltwater environment, and whole new set of safety concerns. Please refer to more in-depth articles before attempting saltwater fishing.